One of the best places to make an artist book: Wells College Summer Institute! It’s true, the facility is amazing with seven Vandercooks, plenty of lead type cast from the Bixler letterfoundry, an extensive collection of woodtype and cuts. A bindery full of book presses, board shears, and guillotines. The facility is charming, with hardwood floors and windows that look out on to green grass, willow trees, and beautiful lake Cayuga. Whether you have an extensive background in the book arts or you are a newbie, the Summer Institute is the perfect opportunity to work with Robin Price and create your own artist book. 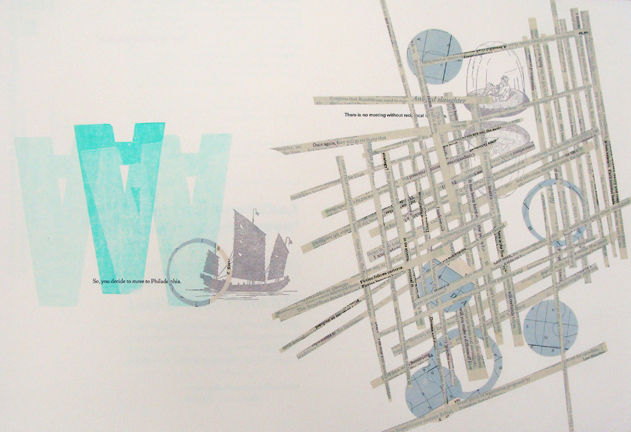 Embracing Chance: Letterpress Artists’ Books is being taught by Robin Price June 14 – 20. Surprise yourself by adapting to chance-based, creative pathways as you encounter changing fields of potential and constraint. 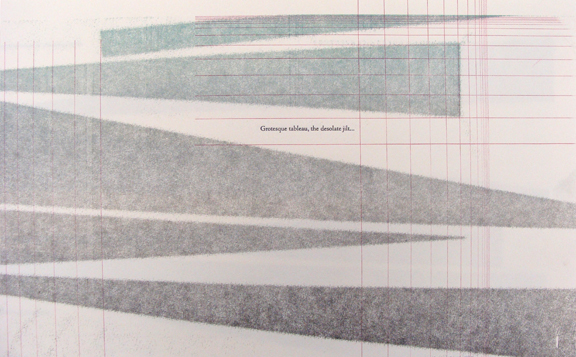 Work with text and image derived from chance operations while making a letterpress artist’s book. Katie Baldwin interview’s Robin Price to find out more about what’s going on in her studio and what she will be teaching this summer at Wells College. KB: Looking at your website, I noticed an image of print trials for your book in progress titled: Love in the Time of War by Yusef Komunyakaa. Can you tell me a little bit about what’s going on in your studio practice? 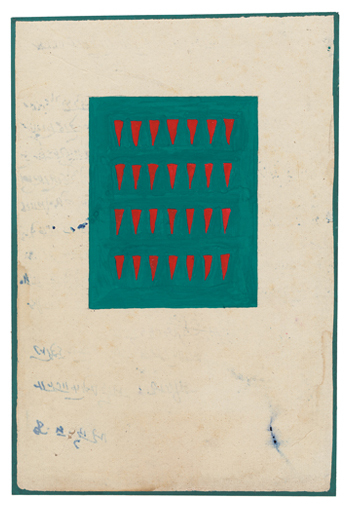 RP: Several months ago a young artist apprenticing at the press, Brittany De Nigris, quietly nudged me toward a transformative development in Love in the Time of War, a 25-poem sonnet sequence by Yusef Komunyakaa, reconstructed as an artist’s book here at the press. I was showing her some press trials I’d done while she was away for a month, all on various thin papers folded at the foredge (the side opposite the spine), plus one on silk fabric. Oh, sure, I said, of course the silk one is amazing, but I can’t afford it and it’s too impractical. I kept talking about the pros and cons, as I saw them, of the other choices, trying to engage her, get her opinion. She didn’t say much, but kept walking back to the edge of the table, fondling the dark-brown stained silk sheet, with a poem printed in silver, and a torn piece of aluminum foil placed within the fold. She held it up to the light, noticed how her hand was slightly visible through the two layers. This, this, her whole being said, until I finally realized she was absolutely right and we had to do it that way, no matter what. The studio became a makeshift chemistry lab and it took a long time to solve some technical problems. 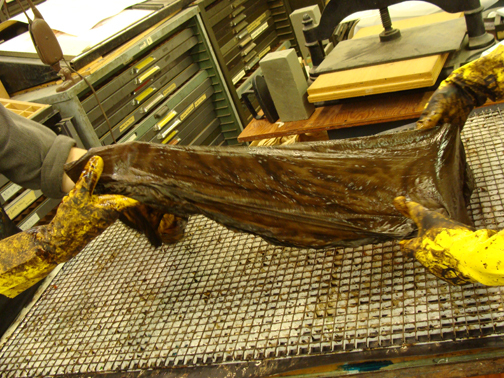 The actual process of staining the silk was quite beautiful – and messy! KB: So, what inspires–now, in the studio? A curtain of fire hangs in the west. as if all the gods are cursing at once. Another timber kneels in the dirt. Second: This weekend, while looking again at the simple Hindu tantric paintings in the book Tantra Song (a book I found out about through Brittany), I got an idea for trying to express similar quiet meditative works with collage. Now I’m hungry to see what happens with that, but there’s not much time to play until I can finish Love in the Time of War. That’s a little frustrating, but I try to pacify myself with the reminder that more mulling before anything physical happens will likely make for stronger work. 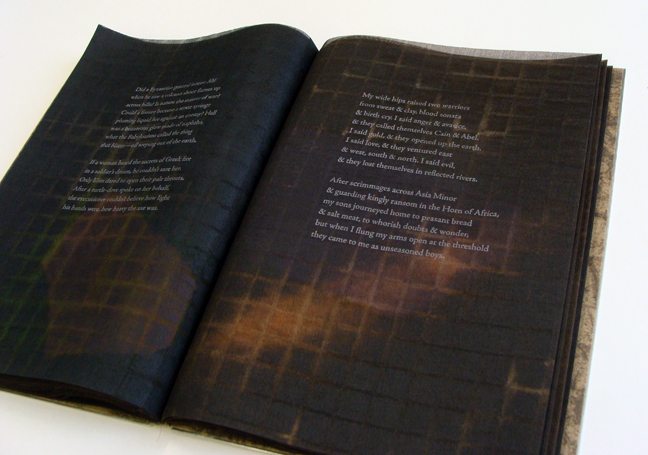 KB: The text for this book is printed on individually painted, hand-dyed silk. It sounds beautiful! I can really appreciate how much an artist book edition requires tests, mockups, and experimentation. I am wondering about your process, how you might arrive at a particular structure or material choice (such as silk pages)? RP: I try to listen as well as I possibly can to what the book wants to be. I realize that sounds pretty esoteric, but what I’m getting at is the loss of ego: it’s not about what I want the book to be. Yes, just as you say, lots of tests and experimentation. Often there’s research into materials or processes that are new to me. Also, my point of origin generally stems from the interior of the book. Something about what will be on a sample page then points toward a possible structure, a potential design scheme, a certain material. Then there are months or years of juggling all the pieces until they form what seems to be a cohesive whole. I aim to stay open to alternate possibilities until the chorus sings in unison, and there’s no solo performer who’s in it just for the headlines. KB: Rumor has it that you have taught at the Summer Institute in the past. What are you looking forward to most when you arrive at the Book Arts Center? RP: Besides swimming in Lake Cayuga? Here’s what: starting every morning and finishing every night with a group of dedicated, passionate, fun people who are there to learn from and help each other, share ideas, and work very hard (which in this context means the same as play very hard). I especially love spying on other classes and the opportunity to learn during the evening presentations. KB: My first experience with the Summer Institute was in 2012. I was struck by the amazing energy of students and teachers. In only one week, incredible, complex artist books were made by both newbies and experts. 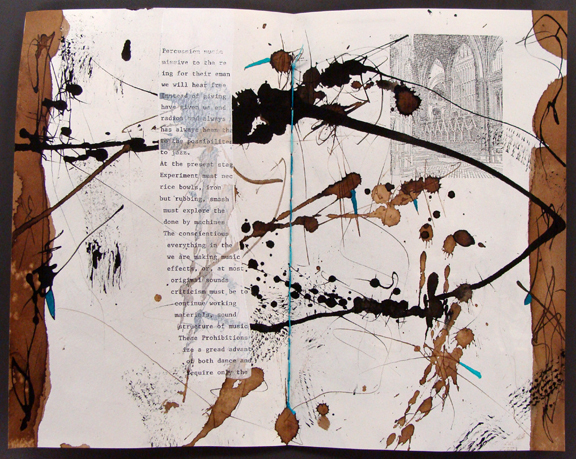 How do you approach teaching when students are totally new to artistbooks? RP: Often the flow of ideas will be broader when there are beginners and more advanced students in the same class, due to the diversity of perspectives. Sometimes beginning students can feel overwhelmed with the abundant technical information, but the more experienced ones seem to naturally step in and offer help, and the stress decreases. There’s also the fun of a beginner determined to make some crazy thing work that my solid fine printing background self would never do, and I have the opportunity, once again, to be reminded of the bold, fearless potential of the untrained. KB: In your course, Embracing Chance, what will students be focusing on during the Summer Institute? And what will they be taking away with them? RP: I hope that students are surprised at every turn, both at what is suddenly put before them and at their own reactions, their own creative responses to something new. The something new might feel uncomfortable at first, or it might feel absolutely liberating. 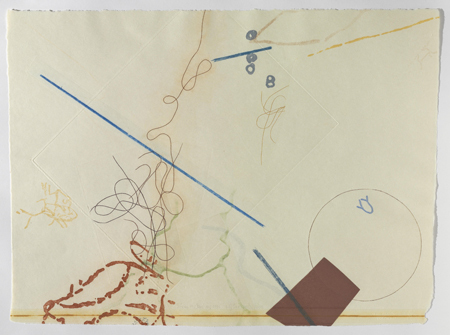 I’d like to pass on what I’ve learned about John Cage and his use of chance operations, and why I feel that approach can be invigorating in the practice of making artist’s books (and in creative endeavors generally). Cage proposed the use of chance as a way to free one’s mind from personal likes and dislikes. I think the reason I keep exploring this topic (over ten years now) involves the connection between that relinquishing of personal taste, if you will, and my desire to keep my own ego out of my books as much as I possibly can. From Robin’s “chance” workshop at University of Utah, 2012. Above: Mary Toscano. Below: Becky Thomas. 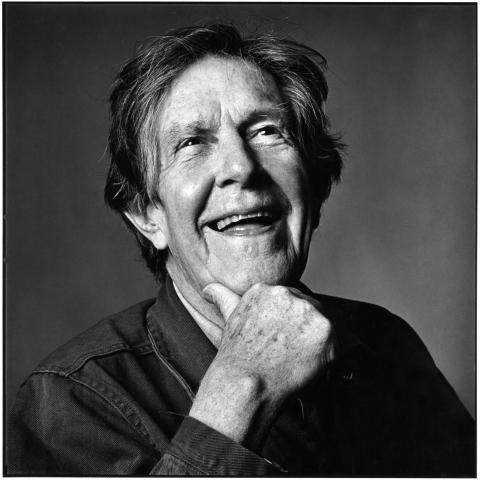 John Cage, from Déreau, Crown Point Press, 1982. RP: There are many more aspects to bringing in chance and how it can propel you into new territory, such as relinquishing control, working within constraints, and responding creatively and immediately to another’s work. We’ll start with a quick exercise that results in a packet of letterpress postcards (enough for each student to keep a set). Our main focus will be a book project that addresses chance and starts as a group endeavor, then participants individually complete their own folios. Technical points I’ll cover include hand typesetting, press lock-up, letterpress printing, paper handling, pamphlet binding, heat-set collage, paper staining, and various printmaking processes such as pressure printing, monoprinting, gradation & rainbow roll inking. Bringing in other media – hand-cutting, stitching, drawing, painting, etc – will be encouraged. Other than the book and postcard set completed in class, I hope the experience settles as fertile ground from which to generate further explorations with chance in the creative process. Robin Price is an artist, letterpress printer & publisher of artists’ books for more than 25 years. The work of the press has become a lifelong, interdisciplinary liberal arts education, and her press books are collected & exhibited internationally. “A chameleon among book artists,” she often seeks out contemporary artists, writers, and artisans with whom to collaborate, striving for synergistic books with extensive diversity in content and form. A major wellspring of inspiration is the purposeful use of chance in creative work, especially as defined by John Cage; she has been lecturing and teaching specifically on that subject since 2002, when she co-curated an exhibition at Yale University Sterling Library with Jae Rossman, “By Chance: Serendipity and Randomness in Contemporary Artists’ Books.” B.A., Pomona College. This entry was posted in Uncategorized by wellsbookartscenter. Bookmark the permalink. The Wells College Book Arts Center, established in 1993, provides a broad learning opportunity for Wells students and the Aurora community in the arts and crafts of the book.